Do Chia Seeds Contain Lignans? Chia has been used as a food and raw material for medicines since as early as 3500 B.C. For centuries, chia seeds were a staple in the diets of tribes in Mexico and the Southwestern United States and were reportedly used as an energy supplement during long journeys and conquests. The seeds, which first entered the modern market adorning little clay figures, have now become recognized for their many nutritional benefits. 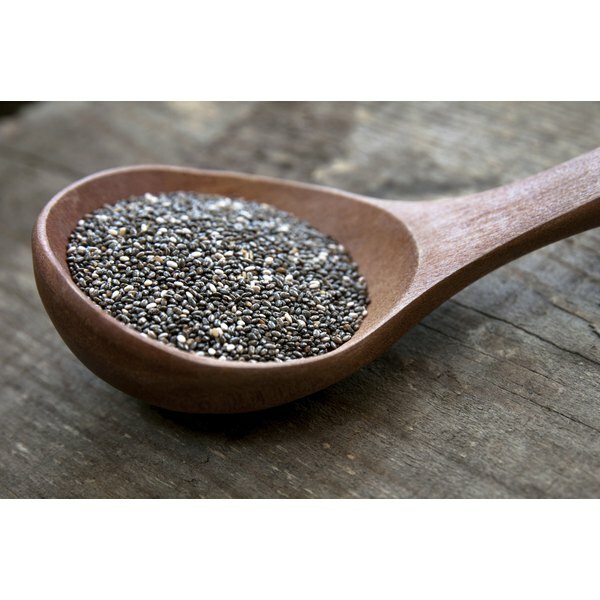 A single serving -- 3 tablespoons -- of chia seeds contains about 11 grams of fat, of which only 1 gram is saturated fat. The rest is made up of heart-healthy polyunsaturated and monounsaturated fats. Chia seeds are packed with omega-3 fatty acids, a type of polyunsaturated fat. Omega-3 fatty acids are associated with many health benefits, including lowered risk of heart disease and possibly stroke. Eating chia seeds as part of a healthy diet may lower cholesterol, triglycerides and blood pressure. Chia seeds, like other seeds or nuts, are a concentrated source of calories. Three tablespoons contain 179 calories. For someone on a 2,000-calorie-per-day diet, this is just over 11 percent of the daily value. A single serving provides 6 grams of protein and 15 grams of carbohydrate. Researchers at the University of Alabama found that chia seeds, when used as an alternative to traditional carbohydrate-containing beverages for carbohydrate loading, provided equivalent sports performance benefits. For athletes, chia seeds may provide a good alternative to sports beverages since they contain far less sugar and increased levels of omega-3 fats. One serving of chia seeds contains almost 13 grams of fiber. For adults, recommended intake for fiber is 25 grams per day for women and 38 grams per day for men. Fiber helps regulate bowel function, lower cholesterol levels and control blood glucose levels. Chia seeds pack a lot of calcium in a small serving. A 3-tablespoon serving contains a whopping 233 milligrams of calcium. Recommended intake of calcium for adults is 1,000 milligrams per day. The amount of calcium in one serving of chia seeds is only slightly lower than the amount found in 1 cup of milk -- 299 milligrams. In addition, one serving of chia contains 2.8 milligrams of iron, as well as other important nutrients such as phosphorus, potassium, magnesium and zinc. Chia seeds can be sprinkled over salads or cereal, stirred into yogurt or incorporated into almost any recipe. Recent years have seen an explosion in the number of products containing chia seeds, including granola bars and other snack bars, cereals, crackers, chips and beverages. Chia seeds do not need to be ground and do not go rancid the way that flaxseeds can. The seeds absorb liquid when soaked and can be blended into juices or smoothies. Since the seeds do not have much noticeable flavor, they can be a kid-friendly way of adding extra nutrients to just about any food or beverage. Chia sprouts are also edible, and can be added to sandwiches, salads or other dishes. Academy of Nutrition and Dietetics: What Are Chia Seeds? Christine Kasum Sexton writes about food and nutrition with a focus on health promotion, plant-based diets, and sustainable food systems. Sexton is a Registered Dietitian, and holds a Master of Public Health Nutrition from the University of Minnesota.